When big news happens, the world tunes in and then moves on. But often the stories we thought were over haven’t really ended. They were the beginning of something else. 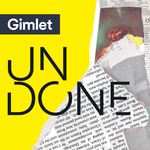 Undone is a new show from Gimlet Media that digs up the surprising things that happened when we weren’t looking. Hosted by Pat Walters. Ibrahim Parlak came to the U.S. in 1991 as Kurdish refugee; his friends and neighbors see him as the ideal American immigrant. But the U.S. government considers him "the complete terrorist package" and has been trying to deport him for over a decade. We try to figure out why the two see him so differently. This is a story about a forgotten part of civil-rights history that is still very much alive. In 1965, a group of black men in Louisiana called the Deacons for Defense and Justice took up arms against the Klan. Now a daughter of the Deacons wants to start a museum in their honor, but not everyone in town wants their story told.